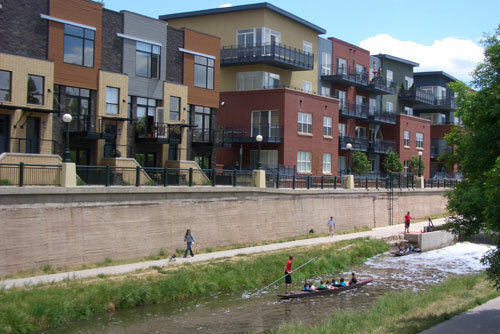 Creekside is a newer 160-unit condominium development located right on Cherry Creek in the Central Platte Valley, downtown Denver’s newest community. To the northwest is Commons Park along the South Platte River, to the southwest is the Pepsi Center and to the northeast is Coors Field and historic Lower Downtown Denver (LoDo), with its endless array of restaurants, pubs, museums and cultural performances. Built in 2005, no two of these flats are exactly alike, and all boast the sleek, urban architecture and design elements you’d expect to find in the most upscale lofts. Ranging in size from 600 to 1200 sq. ft, all of the residences feature imaginative interior finishes, top-quality construction, and the most modern appliances and fixtures. 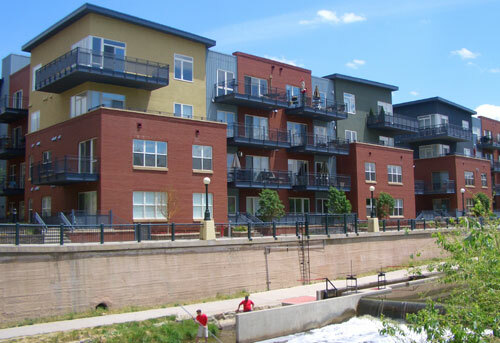 All have terraces or balconies and many have views overlooking Cherry Creek. 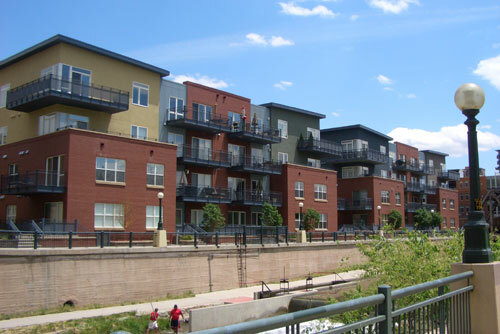 Exterior - adjacent to the Townhomes at Riverfront.